Of all the discernments a judge must make when evaluating our breed I believe movement must be the most misunderstood. 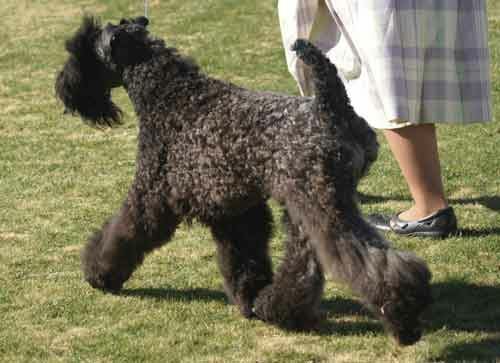 As a breeder of Kerry Blue Terriers I have watched a trend develop wherein many breeders are presenting Kerries with movement akin to Fox Terriers or Airedales. I blame this on the professional handlers to a great degree, then on innocent ignorance of single-tracking versus parallel-tracking in canine movement, and finally a surrender by more knowledgeable breeders to this unfortunate trend in order to survive in the breed ring. As I am also a breeder of Fox Terriers I am well aware of the dynamics of Fox Terrier movement (parallel-tracking) and why it developed as opposed to Kerry movement (single-tracking) and why it developed. The major difference in the locomotion structure of these two breeds lies in the front assembly. Very simply, the Fox Terrier requires a SHORT upper arm; the Kerry Blue Terrier must have a LONGER upper arm. The short upper arm in the Fox Terrier was developed in order for the dog to compress to a small size to facilitate entry into the Fox’ den door, sometimes only a slit in the earth. The Fox Terrier was carried on horseback in the hunt, only set to earth when the fox went to ground. In addition his rear assembly is so designed to achieve greatest pulling leverage, therefore Fox Terriers should be a bit more exaggerated in rear angulation than the Kerry, a dog built more for movement. In his work the Kerry Blue was expected to trot around the farm day in and out, therefore he needed a longer upper arm, which facilitates greater reach for ground coverage coupled with an equally balanced rear assembly. Whereas the Fox Terrier receives it’s greatest propulsion from the strongly angulated rear, resulting in the characteristic “snatching” or upward lifting of the hocks, the Kerry Blue must receive equal propulsion from front and rear assembly resulting in the smooth, flowing, ground covering gate so much desired in a working/herding terrier. I’m not a mechanical engineer, but it seems logical that one can not change one design point without affecting another aspect of the design, at least in crucial areas of operation…i.e. : drive-train or movement assembly. It appears that the Kerry Blue has been “re-designed” with shortened upper-arms, resulting in parallel trackers in recent years to fit a vogue made in the show ring. I theorize that this has been done to fit the less than knowledgeable judge’s (and there are plenty out there) mistaken belief that ALL terriers parallel-track. It saddens me to think that the Kerry Blue, the soundest mover in the Terrier group, might lose its hallmark movement. Perhaps the Board in its wisdom will decide to illuminate the movement passage of the Standard so it will be preserved.